The Advox Netizen Report offers an international snapshot of challenges, victories, and emerging trends in internet rights around the world. This report covers news and events from December 4 – 21, 2018. As they prepare for general elections on December 30, Bangladeshis are navigating soaring political tensions both on the streets and online. 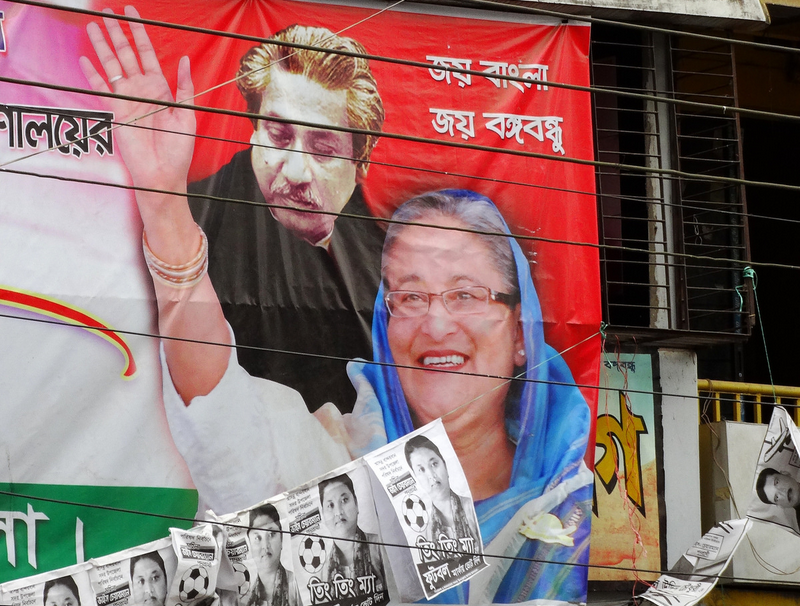 Thousands of protesters and opposition party members have been arrested and many prosecuted  in the lead-up to the elections, which could remove the right-leaning Awami League  party from power. Experts also have called into question the impartiality of the Election Commission which rejected the candidacy applications  of 141 members of the leading opposition Bangladesh Nationalist Party (BNP). Most of these were approved on appeal ,but their initial rejection sent a clear signal about the high cost of contesting the ruling party. In a December 13 statement, Human Rights Watch  Asia Director Brad Adams berated the Awami League for the crackdown and its effects on the democratic process. “The Awami League government has been systematically cracking down on independent and opposition voices to ensure that the ruling party faces no obstacles to total political control,” he said. Political activity and news are also being targeted online. The official website of the BNP was was blocked last week, leaving voters unable to access critical information about the party’s candidates and platforms. After initially claiming ignorance about the reason behind the block, the Bangladesh Telecommunication Regulatory Commission (BTRC) claimed the website presented “distasteful ” content that could harm law and order. The BTRC has the power to unilaterally block websites on national security grounds — it is not required to obtain court approval. In tandem, five opposition candidates were sued  under the controversial Digital Security Act , which took effect in September 2018. And on December 10, the BTRC temporarily blocked 58 websites  on national security grounds, arguing that they contained  “fake and baseless news reports.” Although the list of blocked websites (the Dhaka Tribune  published a complete list) included some that were spreading disinformation likely intended to seed conflict, others are legitimate news and political commentary sites, or sites belonging to the BNP. Social media companies are also removing some material from the web in an effort to reduce disinformation campaigns online in Bangladesh. Facebook reported  on December 20 that it had taken down nine pages with nearly 12,000 followers, reasoning that they were exhibiting “coordinated inauthentic behavior” that the company says was linked to the Bangladeshi government. These included “BBC-Bangla”, an imitation of BBC Bengali  and “BDSnews24”, an imitation of BDnews24 , a legitimate local news site and former partner of Global Voices. Twitter’s Safety account  also reported having suspended 15 accounts on similar grounds. Both companies’ processes for identifying and censuring potentially malicious accounts carry no independent oversight or transparency mechanism. People are taking to the streets  in multiple cities in Sudan, expressing outrage over rising costs of fuel and bread, and overall discontent with the ruling government. Demonstrations have turned violent and eight protesters have died in clashes with riot police. Technical tests by Net Blocks, a civil society group that coordinates technical analysis of internet censorship, indicate that multiple internet service providers were blocking Facebook, WhatsApp, Twitter  and multiple local websites as of December 21. An in-depth report by The Mint  found that at least 50 people in India have been arrested and jailed for their social media posts since the start of 2017. The business news site owned by HT Media (Hindustan Times’ parent company) interviewed multiple defendants and found that the majority of those arrested were Muslim, low-income and relatively new to using the internet. In most cases, they were booked for criticizing either the Prime Minister or the ruling party. Authorities have brought charges against the defendants under India’s IT Act and penal code sections that address sedition and obscenity. Singaporean independent news and commentary site The Online Citizen (TOC) is facing a criminal defamation probe  for publishing a letter accusing top government officials of corruption. The letter was written by Willy Sum, a government critic. On November 20, police raided the home of TOC editor-in-chief Terry Xu, confiscating computers and other equipment, and forcing the news website to declare a hiatus  from publication. Xu was also interrogated  by police for eight hours. TOC removed the allegedly defamatory letter as soon as it received a takedown notice from the Infocomm Media Development Authority (IMDA), an agency of the Singaporean government. TOC is back online, for now. The family of Egyptian blogger and activist Alaa Abd El Fattah is getting ahead of the Egyptian justice system by advocating for his timely release  from prison, scheduled for March 17, 2019. Alaa was arrested and jailed in November 2013. In February 2015, he was finally tried and convicted of “organising” an unauthorized protest , and sentenced to five years in prison. While he did take part in a protest  against military trials for civilians on 26 November 2013, Alaa had no role  in organising it. Alaa’s March release date does not mark the end of Alaa's time served, but rather a transition to the final phase of his sentence. After his release, Alaa will be made to spend every night in his local police station for an additional five years. Afef Abrougui , Joey Ayoub , Rohith Jyothish , Oiwan Lam , Elizabeth Rivera , Taisa Sganzerla , Ivan Sigal , and Ellery Roberts Biddle  contributed to this report. CORRECTION [December 31, 2018]: A previous version of this report identified blocked website bdpolitico.com as being the blog of British journalist David Bergman. In fact, Bergman is the author of bangladeshpolitico.blogspot.com, a separate site. Although Bergman's site is blocked in the country on certain ISPs, it was not blocked in this particular episode.